Brazil legend Ronaldo could finally return from injury to make his Corinthians debut in a Copa do Brasil tie on Wednesday. The 32-year-old striker has been out for more than a year but could feature from the bench against Itumbiara. Coach 'Mano' Menezes said: "Ronaldo is ready to play 45 minutes and will be on the bench in the Itumbiara match. "He will maybe play some minutes in the second half depending on how the match goes. "I make my decisions according to what I think is correct. At the moment, ideally he will make his debut during the match but won't start." Ronaldo has not played a competitive game since February 13 last year when he suffered a serious knee injury playing for AC Milan. He was fined for breaking a curfew last week. At last.. Best soccer player my eyes have ever seen. Ronaldo is done, so is Ronaldinho, they had their time, but now they have the bad brazilian soccer player habits, and they are not in shape. But i'm still dying to see Ronaldo's fat [expletive] play after the injury. Definitely it would be nice to see him play well again. Probably the best Ronaldo mix on youtube.. just AMAZING. Dude is so damn fast. Edited by #24, March 04, 2009 - 10:29 AM. 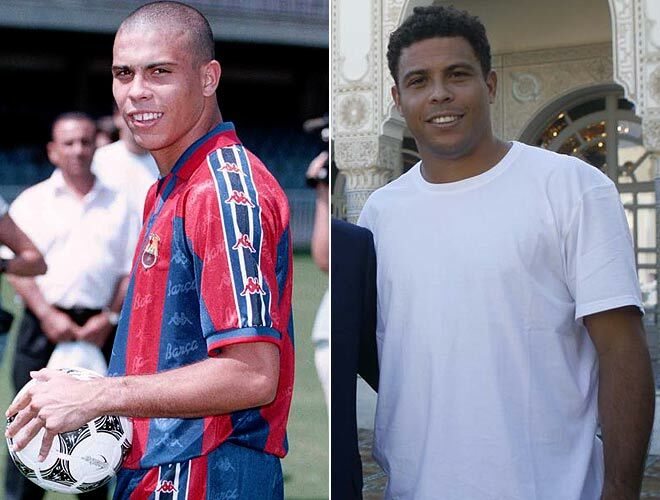 too bad ronaldo is with trannies nowadays!! After more than a one-year injury layoff, Ronaldo finally returned to action with his new club Corinthians. Ronaldo may have only played 29 minutes, but he looked very lively, and even came close to getting on the score-sheet. He replaced Jorge Henrique in the 21st minute of the second half and one minute later he had his first touch of the ball. The excited crowd at the Juscelino Kubitschek stadium in Itumbiara roared each time Ronaldo came close to the ball, and the former FIFA World Footballer of the Year tried to impress them with some of his trademark trickery. He showed no signs of an injury, although it was evident that he was lacking the necessary fitness to play a competitive football match. But Ronaldo, 32, constantly asked for the ball, and instead of passing the ball as soon as he got it, he preferred to take on his opponents, and with good results. Towards the end of the match Ronaldo looked to mark his debut with a goal. He fired a long-range effort wide of the right post, and minutes later he forced his way into the area, but was penalized for pushing. As a follower of Brazilian Football, I actually watched the game in which he played and scored in. I think he has the ability to get into fit shape again. RONALDO FOREVER! !....just let him in ONE more world cup..thats all i want..i dont care what he is..super sub..starter...goalie...just let him play one last time! He's too far down the pecking order for Brazilian strikers. Luis Fabiano, Pato, Robinho, Adriano, Amauri, Keirrison, Diogo and so on...All of these guys are miles ahead of Ronaldo. Well, he IS one of the better strikers for Brazil.